Note: The illustration cannot be borrowed for other xxxxxxwebsites without permission of the Guild. There are three basic categories of vestments: the Conical, the Roman and the Gothic. Within each of these categories there are a number of different styles. In each of these styles the maniple, stole, veil and burse are made to match the chasuble. 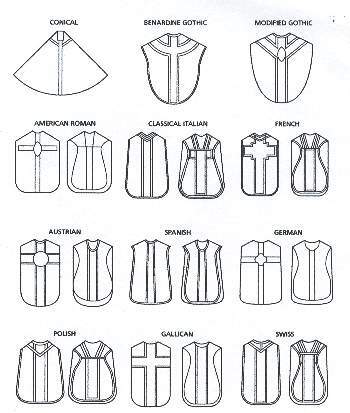 The illustration shows the basic shape and trim of a number of the different chasuble styles. The St Benet's Guild can make any of these styles and many others.